Ross Casting and Innovation, LLC (RCI) is headquartered in Sidney, Ohio. RCI has been supplying quality aluminum castings for more than 75 years to a wide range of customers in the industrial, and automotive markets. Currently, RCI is a world leader in R&D and production of cold-side turbocharger compressor wheels serving a global market. 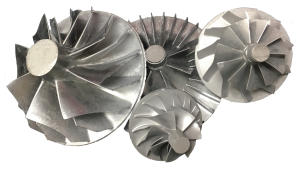 RCI employs innovative casting and process technologies that set the industry standard for turbocharger wheel production and performance. Our broad casting knowledge base is complimented by our in-house machining, balance and test capabilities which provides our customers with turnkey products. It is our mission and goal to continue to be a world-class producer and supplier of quality turbocharger compressor wheels – utilizing proprietary technologies and quality processes will allow us to continue to meet and exceed the expectations of our customers. nothing more or less than a group of people who have voluntarily joined together in a common enterprise. The things they build and produce are the result of the intrinsic character of the people themselves and the way they have responded to the challenges of their times. Ross Casting and Innovation is proud to announce it has acquired IATF 16949 certification. RCI endeavors to maintain our quality standards which are essential to achieving our business objectives.